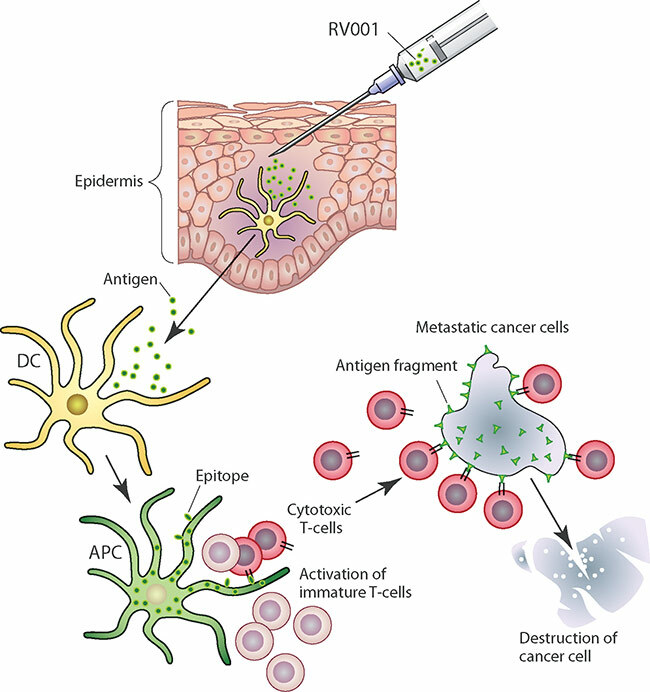 RV001 – an antigen – is administered through injection under the patient’s skin. RV001 encounters dendritic cells – a type of white blood cell with a regulatory function in the immune system – which are present in the skin. These cells are specialised to capture, absorb and process antigens. These dendritic cells interact with naïve T cells, converting them to become target-specific killer cells. Helper cells are also formed, whose function is to strengthen the immune system’s disease-fighting capacity. A specific immune response is thus established against cells overexpressing RhoC –metastatic cancer cells. This response involves killer cells attacking the cancer cells and helper cells producing cytokines that strengthen the anticancer immune response.